THE data tells a fairly dismal story about Singapore's efforts to transform the economy and raise labour productivity. But there are signs that change is afoot at the industry level, Deputy Prime Minister Tharman Shanmugaratnam said yesterday. Though "progress has been slow" since economic restructuring began in earnest in 2010, companies in various sectors have been investing in technology and developing new business models, he added. Mr Tharman, who is also Finance Minister, was speaking to the media after a visit to QB Food Trading. The company, which specialises in the import, processing and distribution of food products, invested about $1 million in an automated production line for packaged 20g cheese portions. The machines, with a robotic arm, have boosted the company's daily production volume by 60 per cent, from 40,000 portions of cheese a day to 64,000. The project, completed in June, has also halved the firm's manpower requirement for the cheese cutting and packing process from six workers to three. The work was previously done manually. The cheese is supplied to supermarkets, hotels and airlines among others. "Firms are taking the initiative and gaining market share, and other firms are losing out," said Mr Tharman. "That's what industry restructuring is in reality. Our job as the government is to provide as much support as we can to the progressive firms." The Government is gunning for labour productivity growth of 2 per cent to 3 per cent a year by 2020 - hopefully accompanied by higher real incomes and better jobs - as it overhauls the economy by cutting down on foreign workers and encouraging companies to become more efficient. Labour productivity fell 1.3 per cent in the second quarter over the same period last year, and rose just 0.7 per cent in the first three months of this year. It has inched up 0.2 per cent a year from 2010 to last year. Beyond the data, which tends to be driven by cyclical factors in the short term, "it is important to look at real changes taking place within each industry", the minister said. Macro-level statistics have been weak partly because some lower-productivity sectors were growing more rapidly, he added. In addition to manpower constraints, QB Food decided to invest in machinery because of "missed opportunities" from being previously unable to ramp up production in line with customer demand, said Mr Kim Quah, the company's sales director. There is "a lot of potential" in the portion cheese segment, and the firm is looking into supplying to the Middle East, he added. It already exports products, including meat, condiments and coffee, to Malaysia, Indonesia, Hong Kong and India among others. 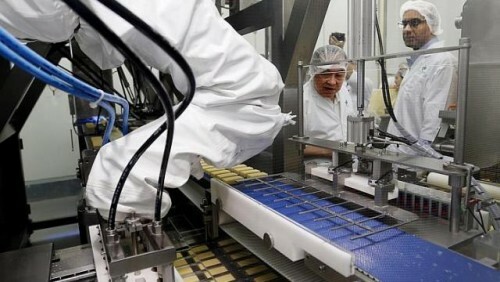 The family-run firm, which sees turnover of about $40 million to $50 million a year, is believed to be one of the first in the food industry to incorporate robotics in its processes, Mr Quah said.